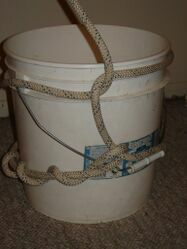 Attach a rope to an oddly shaped object. The killick hitch is a type of hitch knot used to attach a rope to oddly shaped objects. This knot, also known as the kelleg hitch is an alteration of the timber hitch. A killick is a small anchor. The killick hitch was used to anchor small boats. This page was last edited on 29 November 2009, at 14:36.